The journey to Sweden was reportedly an incredibly trying and involved travelling by both boat and rail over the course of about two weeks. Not wanting their skills to slip, Kanakuri and his teammate reportedly kept themselves in shape by endlessly running laps around the boat, and later when they travelled by rail, jogging around the train station whenever it stopped. According to Kanakuri, around this time he happened upon a garden party being held in a well-to-do banker’s villa and decided to grab a drink with the host after spying that they were drinking orange juice. After about an hour of recovering, Kanakuri decided to forfeit the race and caught a train to Stockholm where he stayed in a hotel until his boat back to Japan arrived. Upon getting back to Japan, as thanks for allowing him to recover in their villa, Kanakuri sent the banker a mysterious box with a scroll inside covered in Japanese writing that became a treasured memento of the occasion for the family. (More on that in the bonus facts section). In his native Japan, Kanakuri’s failure in 1912 was roundly criticised by the media and Kanakuri himself wrote of how ashamed he was of himself in his diary. However, some coverage was more favourable, commending the young athlete for even being able to compete on the same level as the best in the world with so little preparation. (He was only 20 when he ran the marathon and had trained for less than a year). 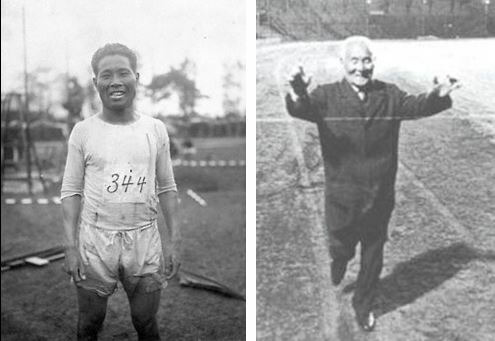 Despite this initial setback, Kanakuri became a key figure in the history of long-distance running in Japan, establishing the Tokyo-Hakone Round-Trip College Ekiden Race, a relay race for university students that helped foster a longstanding love of the sport in the country and something that led to him being crowned “the father of Japanese marathon”. After retiring from the sport in 1924, Kanakuri became a geography teacher. Kanakuri’s performance in the 1912 Olympics likely would have been forgotten if not for his absconding becoming something of an urban legend in Sweden, with him coming to be known as “the missing marathoner” in Stockholm. Worried Kankuri wouldn’t visit if he knew what was going on, he was invited to Sweden under the pretence of celebrating the 55th anniversary of the 1912 Olympic games- a curious request, but Kanakuri happily obliged regardless. It was a long trip. Along the way, I got married, had six children and 10 grandchildren. Kanakuri passed away in 1983 at the age of 92. In honor of his contribution to the sport of long distance running in Japan, the grand prize for the aforementioned relay he started was named after him. During his brief trip back to Sweden in 1967, Kanakuri revisited the villa he’d ended up at over 50 years prior and shared a glass of orange juice with the son of the host who’d invited him to rest with them. While the two were chatting, the son asked Kanakuri what was in the box he’d sent his father as nobody in his family could read Japanese. Kanakuri sheepishly responded that it was simply an old customs form he had lying around he put in the box because it looked kind of important.